Ahhhhh I can’t believe we’re so close to Christmas! It always seems like the days drag on leading up to the big day, but then it’s all over so fast. So this year I’m trying to savor each moment leading up to the 25th so it doesn’t zip by me! This week’s WIAW is what I ate Monday and it’s a random assortment of old favorites and new foods…and there’s even a recipe thrown in there. I’ve been alternating between homemade waffles and protein chia puddings for breakfast. This waffle was carrot cake inspired–filled with carrot shreds and raisins, and topped with coconut and vanilla ‘frosting’. The Sunwarrior is new to me, and not my favorite protein powder, but I think it’ll grow on me. OOTD: colorblock dress (American Eagle), pink heart necklace (Forever 21), tortoiseshell hipster glasses (American Eagle). It was not warm enough to wear this dress on its own (Colorado in December isn’t quite that nice!) but I paired it with my faux leather jacket, grey tights and my favorite grey wedge booties and felt like a total fashionista hipster. This is my first winter-appropriate dress and now I want even more–dresses are my absolute favorite thing to wear so it’s nice not to have to say goodbye to them during the colder months! Lunch: fresh raw lemony kale salad topped with raw sunflower taco ‘meat’, mango salsa and guacamole. I love kale salads for lunch but I need a way to mix them up. Enter: raw sunflower taco ‘meat’. Obviously it’s not meat, as I am vegan, but it replicates taco filling so well…actually, better than taco filling! I’ve seen a few recipes for raw vegan tacos so I tweaked those to come up with my own, crave-worthy taco filling that’s totally raw, packed with healthy fats and protein and is delicious. Pulse all ingredients in a food processor until it comes together and resembles taco filling. Serve in kale or lettuce leaves with guacamole, salsa and raw cashew cream. Makes about 1 cup. Lunch (part 2): fresh Satsuma tangerine. Can’t go without fruit or something sweet to end lunch! On my trip with my dad to WF over the weekend we picked up some Satsumas which are my favorite type of citrus fruit, and luckily, they’re actually good this year. I love how pretty they look with their leaves and stems, too. Snack: rice cake topped with cheap girl pumpkin butter/chocolate chips/coconut shreds, baby carrots, peanut flour paste, Theo orange dark chocolate square, fresh fig. The snackplate lives on! Sadly I had to toss the fig after a few bites because it was dried out inside and not tasty, but everything else was. The rice cake combo is something I’ve been having almost daily–there’s just something about pumpkin butter, chocolate and coconut that goes together so well. Dinner (repeat photo, sorry): pineapple ‘fried’ quinoa with edamame, kale and cauliflower. As much as I love to give new recipes a try, there’s nothing like reinventing a classic. I’m just obsessed with pineapple ‘fried’ quinoa for some reason and I’ve been eating it at least once a week. I think it’s the sweet, salty, spicy and crunchy combo that just gets me. It’s so good and it’s so quick and easy to whip up. Dessert: PB chocolate microwave protein cake topped with Nuttzo, java chip coconut milk ice cream, Alter Eco mint dark chocolate square. I’ve been having some kind of protein cake for dessert for at least a week now and I don’t see it stopping anytime soon. This version is probably my favorite though–I just combine peanut flour and raw chocolate protein powder with a splash of unsweetened almond milk, baking powder and sometimes a few Enjoy Life mini chocolate chips (love them!) and pop it in the micro for a minute until it puffs up and turns into a cake-like consistency. I sometimes have it with a small side of coconut milk ice cream and a square of dark chocolate if I want a little extra something. Do you prefer making new recipes or sticking with old favorites? Do you like citrus fruits? Recipe submitted for Healthy Vegan Friday #22. Do you have any recipes that you return to again and again? Maybe you make it every year for a certain holiday, or just on a laidback weekend for a quick meal or snack. I think most of us have at least one tried-and-true recipe we make often, whether it’s one we came up on our own or one from a blog or cookbook. For me, this would be my festive garland bars. I first saw the recipe on the Whole Foods site about a year ago, and I knew right away that I wanted to veganize them. I did, and I made quite a few changes to the original to make it my own and a much healthier option. I know some people like their treats to be totally indulgent, and that’s completely fine, but I’ve got a huge sweet tooth so I always healthify my treats to make them a better option for a more regular dessert. I first made the bars over Thanksgiving break last year and loved them. It was my first foray into reintroducing chocolate back into my life after starting recovery from my ED, and it was a big step forward for me. Now if you read my blog like, ever, you’d know that I love dark chocolate and almost never go a day without it in some form. So it was definitely time to return to these bars. But since last year, I’ve made even more changes to my diet. I usually stick with gluten free grains because they make me feel better and I love the different tastes and textures they provide to baked goods. So I replaced the oat flour I originally used (oat flour can be gluten free, you just have to check to make sure it is certified g-free) with Garden of Life RAW chai protein powder and buckwheat flour, which give it a bit more protein power. I also cut back on the maple syrup and chocolate chips, and cut out the dried cranberries because I didn’t have them on hand. I also scaled down the recipe to make fewer bars because Thanksgiving break is just around the corner and I didn’t want to pack too much extra food when I go home. It turned out to be a delicious experiment–just as yummy as I remember them, and a little bit healthier to boot! This year’s version of my fave dessert recipe. Preheat oven to 350 degrees. In a medium bowl, whisk together flour, protein powder, baking powder and salt. Stir in cacao nibs until combined. In another bowl, stir together maple syrup and pumpkin until smooth. Add dry ingredients to wet and add in a splash of almond milk if needed. Pour batter into a 7X5 baking dish and bake for 20 minutes, or until springy to touch. 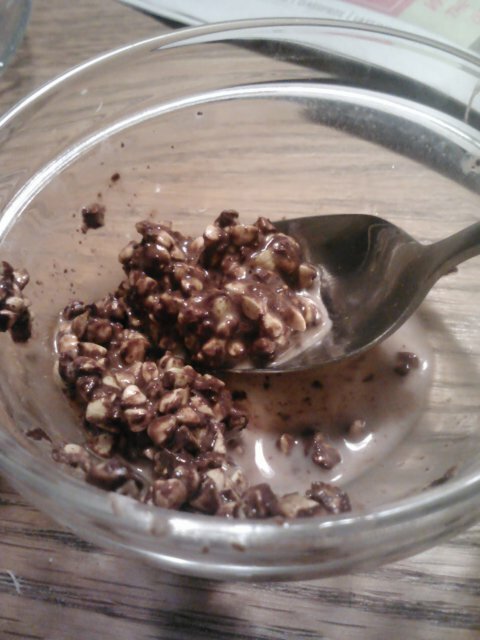 In a microwave safe bowl, heat chocolate chips until melted. 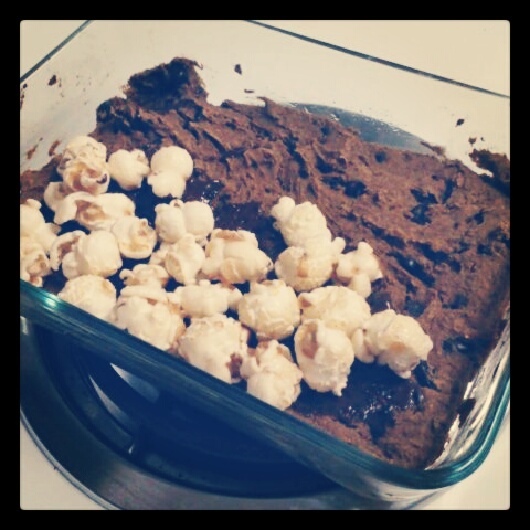 Pour chocolate over cooled bars and press kettle corn into chocolate. Let the melted chocolate set and then cut into 6 bars. Have you ever reinvented an old favorite recipe? How do you feel about healthifying desserts?